Road Pickle Motorcycle Bohemia – Where Should Sash & Highway Go Next? You Decide! Already month long trip, and Sash with Highway are not planning on returning to their home any time soon. About few days ago they have stopped at Gila Bend, AZ. If you live in Gila Bend, AZ check out Spage Age Restaurant along Route 85. The restaurant is equipped with items for space and alien life. Take a look what I mean in the below video of Sash wearing our awesome vest! Next let’s jump to La Siesta Motel for a great deal of just $60.00 for a cabin with a queen bed, ac, microwave, fridge, coffee maker, shower, cable TV, pool and spa. How does Sash do with interviewing local historian? At the visitors center, in downtown Ajo. Downtown Tucson, AZ enjoying electric and creative scene on the streets. But the trip is not over it is your time to tell Sash & Highway where to go next! You decide where they will end up! My name is Sabine and I was born in Luxemburg. If you want to find me check out my facebook page, however, everyone calls me Baby Frogg. I have just entered competition to win a bike, and to accomplish my dream of riding with Betsy and Kevin in America. With your help I will be able to do that, and much more, including meeting bikers from all around the world. The competition is until April 13th, 2013; you may vote once a day for my picture. I could really use your support, and I am very thankful for all the votes. I have been living in Malaga, Spain for over 24 years. But you might have seen me on a Fat Boy special over the past days. The picture was taken in the summer at El Chorro Lac Malaga. If you have not seen me at all you better click here, or out’s you will miss out on a lot, if you know what I mean. Thank you for all support from everyone! Spread the word about my competition. Click here to vote for Baby Frogg picture. Guest post by Sabine. eBikerLeather crew votes once a day for Baby Frogg, it only takes 1 minute, so contribute to help her accomplish the dream. 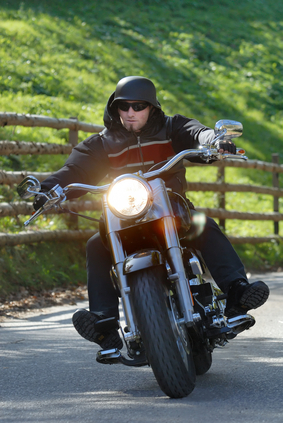 The freedom jacket from Harley Davidson is part of the 110th Anniversary of Harley Davidson. Harley riders are united by simple concept of a single leather jacket on a trip around the world. When the journey began the jacket had no name and there was no plan for a trip around the world. The jacket was just an ordinary motorcycle jackets worn by a rider. Mark Richer is the ordinary motorcycle rider who works at Harley Davidson as Chief of Marketing Officer. Mark rode 2,000 miles across China’s Tibetan, from Xining to Tibet. While on the ride people were taking pictures, and stepping outside to see if the Harley rider has passed by. Richard learned local custom following road 109. He also asked a local man to use his red paint to write something on the jacket that would express his thoughts about Harley Davidson. The moral of the story is that Harley Davidson can unite people all over the world. Whether you are in China, United States, or Europe Harley Davidson will unite you as brothers and sisters of Harley Davidson. His name was Dangerous Dan and he was my Daddy’s best friend. I didn’t care much for him because he didn’t like kids too much, and being 4-years-old, that meant me. But he was nicer to me than my siblings because I knew how to behave with my Daddy’s friends. They called my Daddy “Scary Larry” and he called them his “Brothers”. There were so many that came to our home, I could never keep track of them all. They rode what we children called choppers, had tattoos of naked women or snakes on their suntanned arms, and smelled of cigarettes and the road. They came to my Daddy to do business and work on their motorcycles in our garage.He had the best garage of all of the Brothers, or so I would hear them say.It was 1969 in Southern California. Daddy ran a “home based” business which was somewhat of a mystery to me, but I knew that he was well respected and well liked. Dangerous Dan seemed to be at our home daily, working with my Daddy on this “endeavor”. We often had the “Ol’ Ladies” stay with us, sometimes for months at a time, while their “Ol’ Man” went up North. I often wondered what “up North” meant, but I knew I didn’t want to go because it sounded like a real bummer. My mother was a wonderful hostess for the ladies, as they would all stay up for days at a time, painting the ceiling, making macrame and other crafts, chattering all night.My days and nights often got mixed up, because I never left our home. Weeks would pass that I never went anywhere but our backyard with my dog Clarence, a 125 lb black German Shepherd/Alaskan Malamute mix. Clarence was my best friend, spending most of his time between me and my Daddy’s friends. He seemed to know the nice ones from the mean ones, growling and baring teeth at anyone who he deemed unsavory. I would wake up at odd hours of the night, wander into the kitchen to find Daddy talking to his Brothers, and crawl into his warm, loving lap. Wide awake, all I wanted was to cuddle with him, smell his skin, and let him feed me his treats of Screaming Yellow Zonkers and Hershey Kisses. Seemingly uninterrupted, the men continued their discussion, smoking cigarettes and drinking beer. I knew not to interrupt them, but be sweet to them if they spoke to me. Daddy would pet me, stroking my hair in his special Daddy way, keeping his attention on the important business of his Brothers. He and his Brothers all belonged to the same club and they all rode motorcycles; American made, of course. It seemed sacrilegious to ride anything else to these men. They all enjoyed working on their bikes in Daddy’s garage because he always had extra parts for them. I remember milk crates filled with gears, carburetors, heads, and nuts and bolts of every kind, stacked up against the wall. At 4-years-old I knew to treat Daddy’s friends with respect, never speak until spoken to, be sweet and pretty at all times, and to never judge a book by it’s cover. Just because someone dressed poorly, it didn’t mean they didn’t have money for nicer things. I would often see these shabbily dressed men pull enormous rolls of $100 bills from their pockets while buying things from Daddy. And many of them were really kind, even the ones who looked really mean. I trusted Clarence the Dog to sort out who I could be sweet with and who I should avoid. I learned that dressing nice was for the Ol’ Ladies and little girls, that no one ever touched any one else’s motorcycle without permission (and little girls never had permission unless they rode with Daddy), and that the men were in charge. I learned that my Mom only answered to my Dad, but she was polite to all of the men, even the one’s she didn’t like. I learned that if the men were talking, the women went somewhere else. But as Daddy’s Darlin’ Baby Girl, it made me feel special to be the only female to sit in on the kitchen table discussions. What I also learned about the Brothers was that they were incredibly loyal to one another. If a Brother needed something, they banded together to help. If an Ol’ Lady needed a home for a while, or someone was getting “hassled by The Man” (who sounded like a real bad guy), the Brothers would come to our kitchen table and talk about it, making a plan of action. It seemed unacceptable to let a Brother down, or ignore his or his families needs. My parents divorced when I was 5-years-old, and I didn’t get to see Daddy nearly as much as I wanted to. When I went to visit him, I often saw his Brothers come and go, and the rules I knew at the tender age of 4 still applied. In his home a sign hung over his television for the entire 50 years of my Daddy’s short life. I like to think of him riding down a long, open highway with Dangerous Dan, wind in their faces, sun shining on their cuts, and the familiar roar of Shovelheads beneath their dirty Levi-clad behinds, heading to assemble their Brothers for a heavenly ride. Big Thank You! to our friend Sash Mouth for this great article! Today I have decided to dedicate this post to all women riders. Those who have been riding for many years and those who just have started riding. Times change and we start seeing a lot more women riders out on the open road. It is great to see women riding along with their men. But it is even better to see women ride by the side of their man. 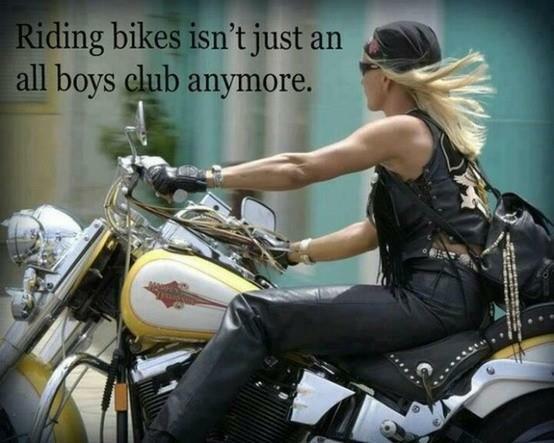 Well my point is to encourage more women to start riding motorcycles. If you always wanted to ride a motorcycle get out there and take that ride. Don’t let people or work interrupt your wishes, make your wishes happen. I have just received a very inspiring message on facebook from Tina. This is really inspiring message to all women riders, never give up and go pursue the dream of riding. eBikerLeather.com is standing 100% behind women riders. As you know we do support Motorcycle Clubs, and I would like to bring your attention to Ladies 1% MC. 121 Ladies are the best group of women riding that I have ever meat. They are spontaneous, courage’s, and never fear to ride. If you are a women that is looking for inspiration I do recommend checking out their facebook page. Check out Ladies 1% on facebook. My family and co-workers think I am having a major mid life crisis. I am 43, with two kids over 20 and a supportive husband. Me and my husband have met at Air Force; rode until I was pregnant. Eight months ago, I was stuck in traffic and a group of riders passed me. One day later I started to research motorcycles online and stopping at every dealer around. After 2 weeks I got brave enough to talk to my husband about wanting a bike. He was very supportive and said to go for it. 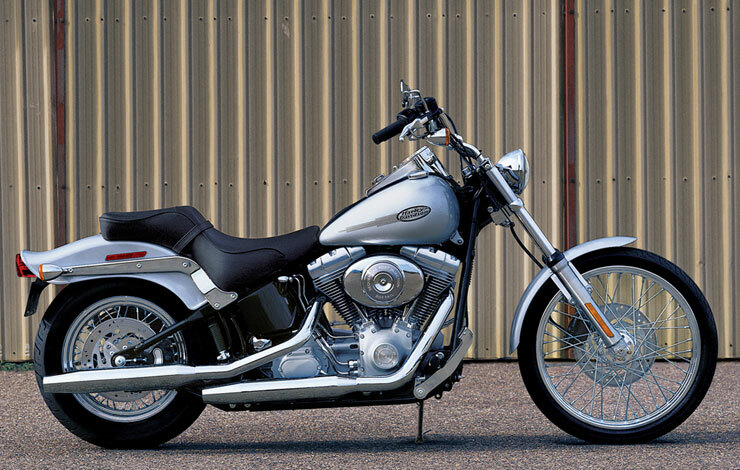 I really fell in love with 2005 Harley-Davidson Softail Standard FXST. It was like love from first sight. I haven’t been on a bike for over 22 years, but I managed to ride around the parking lot without dropping it. I picked up the bike from the seller, and went the same day to DMV to take the written test. I should have found back roads instead of highways. However, I am glad my husband was there to block the traffic with the car for me to ride safely for first time. It took us a good 1 hours to get back home, when it usually is about 30 minutes. Sunday, I rode the biker for 6 hours with stops of course, I had to put in gas 3 or 4 times. The time got away while I was riding, and I remember thinking that I am about 50 miles away from home. As I ride more I realize that I am more relaxed and happy than I have been in long time. I plan now on convincing my husband to ride with me, I just can’t believe I have waited so long. 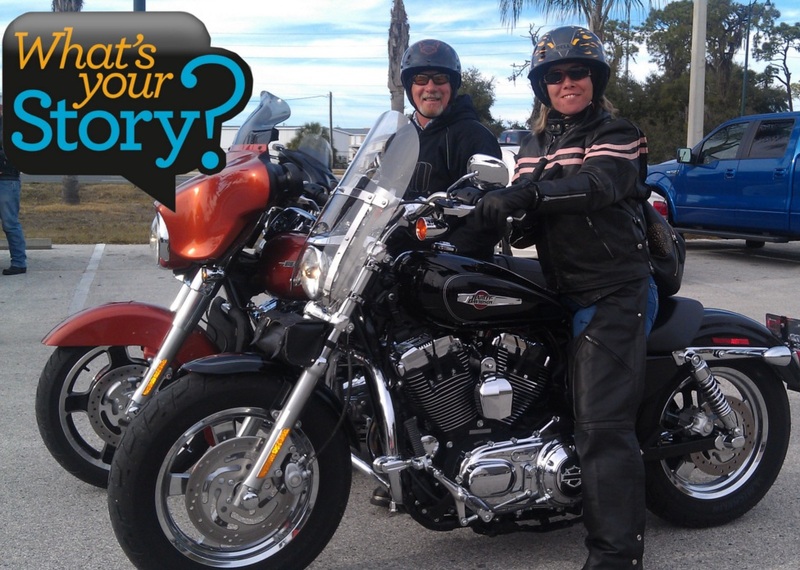 Rider Stories, What is Your Story? Do you have a cool story that you would like to share with us, send it over to eBikerLeather@gmail.com . We will share the story with our readers, and fans. Brake that ice and send us the story of how you got your first bike, or about how much you enjoy riding. Each story send by you, to us will help others learn from your experiences, and gain the knowledge for the road. Don’t hesitate share your story with us today.